If we continue to be in profit, we are having another party at the stable on the weekend of the 27-28th. We still haven't decided on the format, but bring the food and the beer. Playing a short session tonight as well, on Merge it's 4NL. Hero posts small blind [$0.02 USD]. Player1 posts big blind [$0.04 USD]. No worries, my usual levels are 25nl and 50nl on Merge so I'm not quite used to this level of donk-dom and I don't have any stats on villains prior to tonight, but the level of play I see is so atrocious I'm not worried. BTW the guy that stacked off with KT preflop was playing 85/5 through 20 hands. Despite being coolered for one stack flush over flush, and donked for another because KTo is a monster, I managed to grind out a profit of $3.59. Will play more later in the week I'm sure. lol, I know a guy who calls KQo "the monkey nuts"... Maybe KTo is the semi-monkey nuts. BTW about the decision to go with QQ for stacks here multiway, I had already observed players 6 and 8 playing wild and crazy with large overbets and bad hand values (as we see in this hand from player 8 lol). Was actually a little surprised that player 6 folded. The only thing I found a bit concerning was player 7's 3b shove as it was the first big action he made, but since he was playing a 38bb stack I figured he was fishy and with 6 playing like a whack job he would have plenty of hands here that weren't AA or KK. Obv I knew player 8's cold call meant garbage. Also funny, both 6 and 8 were bantering back and forth in chat, and after he rivered the king they both started trying to needle me and get me on tilt. lol Good stuff. 4NL was kind of fun, huge extremes of terrible play from freak loose to super-nit. I see guys like player 8 at 25NL+ sometimes, but the huge fish there are like 1 or 2 on a table with the majority being modest fish or inexperienced TAGs... at the 4NL tables last night it was like 5+ huge fish of variious varieties at almost every table. ps; if you need insight into a donks head, mine is a open book. Will probably play some I'm sure. I've been playing more full ring lately, I guess watching frosty's live training sessions gave me the itch to look at full ring again... and the table stats at 4NL FR looked reallly good so I just went with that for last night. Another short session tonight, this time 2 tables of FR and 2 tables of 6-max as there were only 2 FR tables that had good looking lobby stats. Despite that debacle, and getting rivered several times on the 6-max tables (W$SD 27% lol yikes) I managed to hang around with aggressive restealing (lots of late position huge steal %'s) and then win a 3 way all in pot with AK vs JJ and 77 when I flopped an ace and held. So I ended with another $2.58 in profit, I'll take it all things considered. Played another late session, much more boring this time. 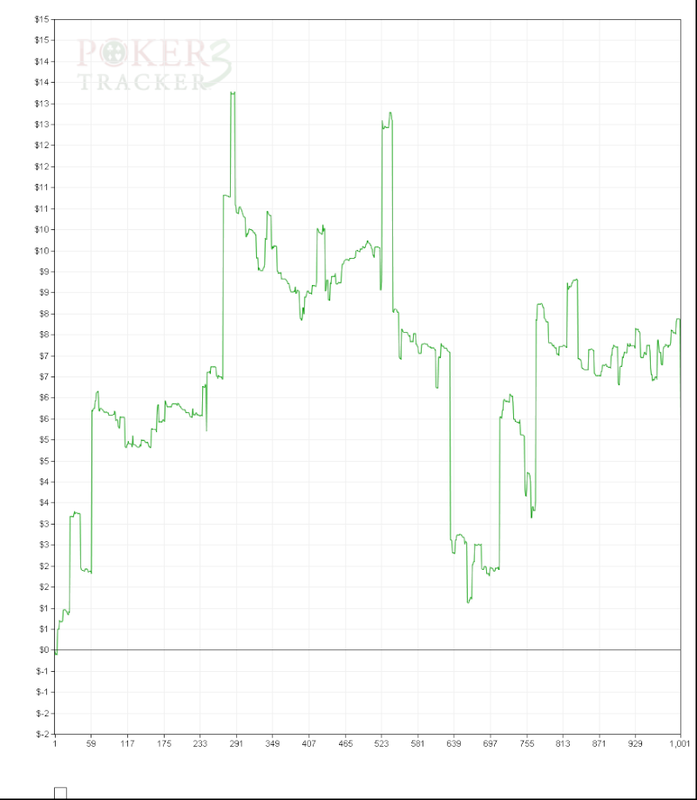 No coolers or stack punts on the first 5 hands to recover from , just a slow, boring grind. Not sure if I'll play more this week or not... I'll be at the WSOP Circuit tomorrow and Saturday so if I play any more it'll be on Sunday, if I have time. As mr. burns would say, Eeeeeeexcelent! Thanks guys!